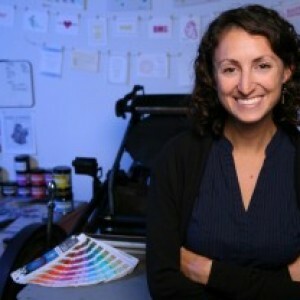 Shayna Norwood started her letterpress business in December 2008, when she decided to design and print her own holiday cards to send to friends and family. At the end of 2010, after she got laid off from her part-time job, she saw it as a blessing in disguise, and decided to go full-time with Steel Petal Press, which she has now been running for almost three years. Letterpress, a boutique printing process, was invented 500 years ago. Gutenberg invented moveable type, which was the basis of all printing for hundreds of years, and, up till the mid part of the 20th century, it was used to print everything. In the 1950s and 60s, offset printing was invented, which replaced letterpress as the basic printing process. Letterpress is a much more labor intensive printing process, but fortunately, it’s had a resurgence in popularity in recent years. Watch this video as we interview her and find out how and why she got started, the origin behind the name Steel Petal Press, who she serves, and what her plans are for her business.